Our Poster is ready to be released for Use!!!! 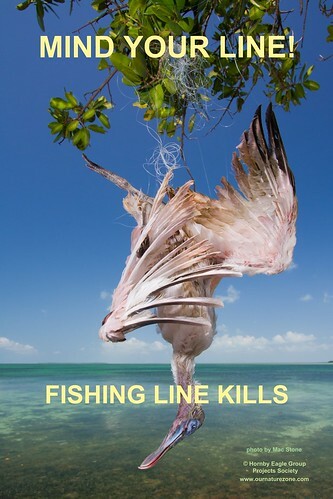 Fishing line entangles hundreds of birds and other animals each year, who then suffer an agonizing death. The range of animals harmed is alarming, even at great distances from water. It is everyone's responsibility to help prevent these tragic occurrences. If you see fishing line - pick it up, cut it up, and dispose of it properly! These two sizes work with the design style of the poster. This is the link to order direct from the supplier, Build A Sign. After you click the link, click the "save and continue". Then you can choose your material and size, and check out. The aluminum sign would need to be mounted on a post, not supplied in this quote. Please get permission before any posting, but particularly the permanent, outdoor signs. We will give you some ideas of where to get permissions on Public Property. This is not the sole duty of the fisherman. Everyone who has ever fished, young and old, has lost some line, through no fault of their own. Line does get snagged in rocks, trees and even broken by the fish. If you see fishing line, fishing hooks, kite string, plastic, etc. please pick it up for all the wildlife, cut it up and safely dispose of it. Lead weights are also a real problem when left in the wild. * Animals that ingest lead often die from lead poisoning. Hooks are dangerous as well. We designed a poster that can be printed out to put on tackle store windows, pier/dock bulletin boards or any place you think would bring awareness to this extra plight on wildlife. Please get permission before any placement. This is an example of how the sign could be installed outside. This is a permanent sign at Ventura River Estuary. This gives us an idea of what could be done. This sign is made of metal and installed on a 2 x 4 piece of lumber. 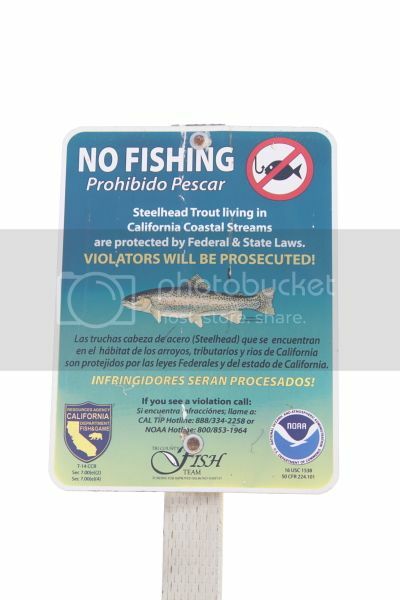 Note that the California Fish and Game, TriCounty Fish team, and NOAA( National Oceanic and Atmospheric Administration) are listed on the sign. 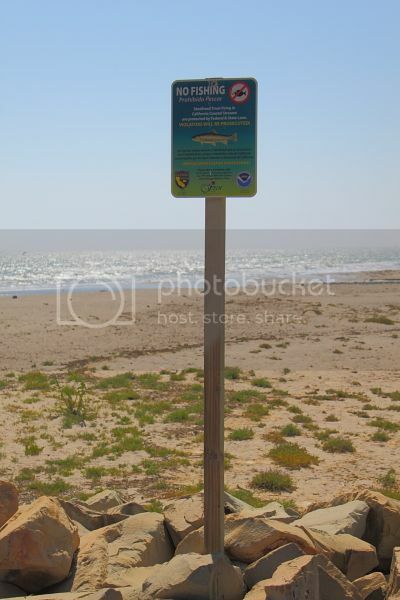 It is an example of the type of agencies you may need to contact to post a permanent sign at a beach, river, campsites, or lake on public property. And that it is possible! A swallow entangled in line dangles precariously above the water, just short of drowning. This bird was rescued and released. This crow hung upside down till it died after its leg became entangled in fishing line and then to a tree limb. A close up of the crow's foot entangled with fishing line. The above photos depict just some of the horrors caused by improperly discarded fishing line. The photo to the left (taken by Bill Buchanan) shows a swallow entangled in fishing line dangling just inches from drowning in the water. This bird was saved. The other two photos are of a crow that was not so fortunate. Its foot became entangled in fishing line and then to the branch of a tree. It hung there until it died.